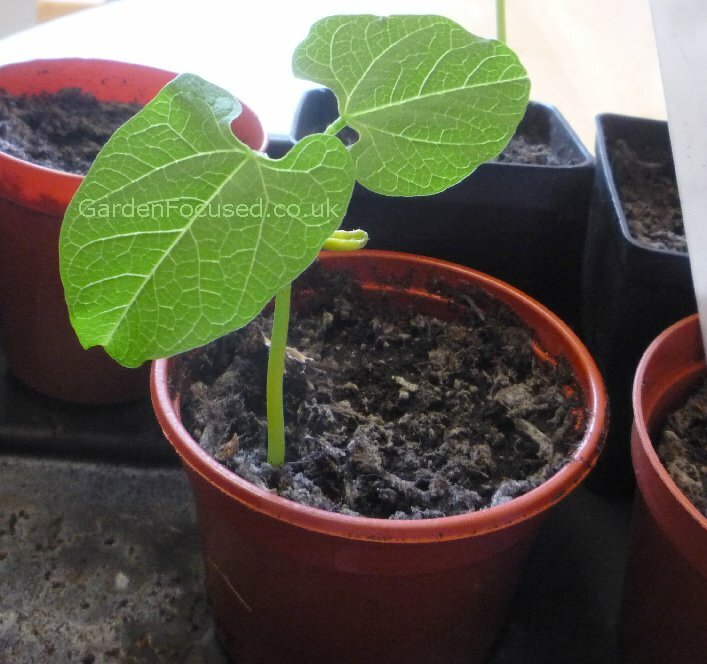 There are four main methods for sowing French Bean seeds, each is described in detail below. Note that the dates given are the earliest dates for your area however French Beans can normally be sown up until mid to late June. By sowing seed at different times you can lengthen the cropping time considerably. The dates on this web page are correct for UK. If you want to change towns, click here. Before sowing or planting any French Beans prepare the soil by digging it well to a depth of 30cm to 40cm. Make sure the soil is crumbly. Add a large handful of long lasting, organic fertiliser (e.g. Blood, Fish and Bone) to every square metre / yard of soil and work it in. The digging is best done a month or so prior to sowing / planting. The best time to sow French Bean seeds directly in the ground in your area is the second week of May. Mark out a groove in the soil which is about 5cm / 2in deep and sow one seed every 10cm / 4in. Cover with soil then water well if the soil is at all dry. If you are sowing more than one row then plant the rows 50cm / 20ins apart. Mark the planting area with plant tags to show which variety has been planted and where. The seedlings will emerge in about 7 to 10 days time, germination success is about 75% in good weather conditions. The seedlings should be thinned out so that they are 20cm / 8in apart. The procedure is exactly as described above except that two or three weeks prior to planting, cloches are placed over the soil where the French Bean seeds are to be planted. The seeds should be sown a couple of weeks earlier than described above, the fourth week of April is the right time in your area. To sow the seeds remove the cloches, sow as described above (including the later thinning out) then put the cloches back in place. Remove the cloches permanently, four weeks after sowing. As with all plants growing under cloches, if the weather becomes unusually warm remove the cloches during the day to allow air to circulate. Using this method you can sow the seeds earlier without fearing a frost and have crops two to three weeks earlier than sowing in the soil outside. Start sowing seed in pots indoors during the fourth week of April. The germination rate is also exceptionally good using this method. Take an 8cm / 3in pot, fill with multi-purpose compost to just below the top. Make a hole about 5cm / 2in deep in the compost, drop the seed in and cover with compost. Keep the compost moist and place the pot in a warmish place (dark or light). Keep a watch on the pots daily and immediately the seedlings appear (roughly seven days after sowing indoors) move the pots to a light and airy windowsill or a frost free greenhouse. A week or so after the seedlings first appeared harden them off over the next week. Two or three weeks after sowing the seeds, the third week of May in your area, plant the potted French Bean seedlings outside. To do this, dig a small hole just a bit larger than the pot, tip the pot up into your hand and remove the seedling and root ball, disturbing it as little as possible. Place it in the hole and fill in with crumbly soil, firm the soil in gently and water well. Each plant should be 20cm / 8in apart and rows should be 50cm / 20in apart. At this stage of their life French beans are extremely vulnerable to slug and snail damage as we well know to our cost. See our page on pests and diseases for a simple and free solution to protect the young plants in the first few weeks of their life. SOW PRE-GERMINATED SEED This method produces good results although it is basically used to encourage children to take an interest in gardening. The principle is to place seeds on damp kitchen paper and store in a warmish position indoors. The seeds will germinate after four days or so and you and your kids will be able to see a sprout appearing from the seed and seeking out the light. Start by placing the seeds on damp kitchen paper on a plate in the first week of May. Cover with a bowl to retain moisture and the seeds should start to sprout in four days or so. When the sprout has reached 3cm / 1in or so it's time to plant them outside (or inside in pots) in crumbly well dug soil. Sow them with the sprout pointing upwards and with the sprout just below soil level. Be careful not to knock the sprout off when planting the seed. The seedling will appear above soil level in a few days time. Dates for sowing seed are the same for dwarf and climbing varieties. More specific details of sowing seed and caring for French Beans can be found above. 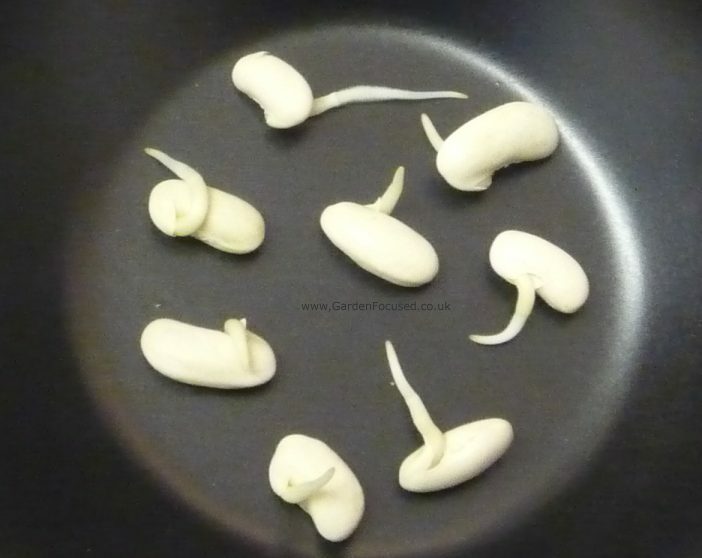 For more detailed instructions on how to sow French bean seeds, click here. For more detailed instructions on caring for French beans, click here. French Beans are a bit fussy about where they are grown and their first dislike is frost. Even a light frost will in all probability kill a French Bean plant, so only sow seed or plant out when all danger of frost has passed. Soil is best if it is on the light side but with a good ability to hold water and nutrients. Water-logged, heavy soils are bad news for French Beans. Originating from Central and South America, these plants like as much sun as you can let them have so a sunny position is definitely best although you will still get a decent crop in light shade. At the same time they like a reasonably constant supply of water, so hand watering may well be needed in warm months. French Beans are included in all crop rotation plans and it's probably best to follow the crop rotation plan. Having said that I know personally of several gardeners who grow climbing French Beans in the same position year after year with no apparent ill effects. They do this because they have erected permanent metal supports for the climbing beans which are not easily moved. So our advice is to include beans in your crop rotation plan but if anything has to be grown in the same position for several years then the bean family of vegetables are probably one of the best suited. We discuss this in detail on our crop rotation page which can be found here. There are two main types of French Beans, the most common and easy to grow being the dwarf / bush types which typically grow to about 60cm / 2ft high and the same width. This type of French bean requires little or no support and starts to produce a crop typically after 10 weeks or so from sowing seed directly in the soil outside, a week or two shorter when the seeds have started off indoors. The cropping period last from four to six weeks depending on the variety. The other type is the climbing or pole French Bean which grows to a height of around 180cm / 6ft. This type requires support in much the same way as Runner beans. Although more difficult to grow compared to dwarf types, climbing French Beans produce a much larger crop from any given amount of space. They also have the advantage that they crop over a longer period. They will take longer to produce a crop however, typically 12 to 13 weeks after sowing seed in the soil. If growing climbing French beans remember that they will grow tall and will cast a shadow, useful for some other vegetables which like to grow in semi-shade but not so good for others which prefer full sun.